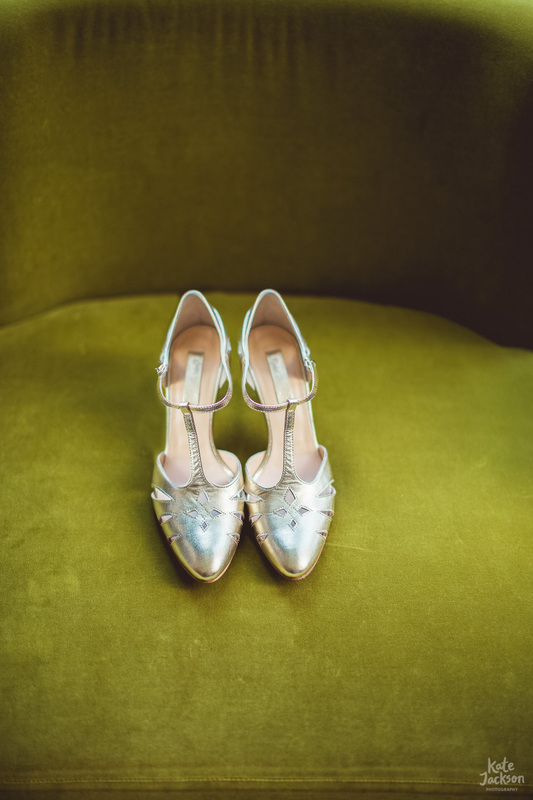 I can't believe I haven't blogged this super fun un-traditonal wedding until now. Because it was the MOST FUN WEDDING EVER. It was super relaxed and so full of love and wonderful fun people. Stuart proposed to Zara in York after a trip to Betty’s Tea Room with a plastic Jeremy Deller ring from Tatty Devine. The ring was inscribed with LOVE IS ENOUGH. She had a emerald ring made after the proposal based on an Georgian design. Zara & Stuart's vision for the day was Easter and Springtime in equal measure, and wanted a relaxed and happy vibe to the whole day. With Easter approaching it felt the perfect time to shout about it now. 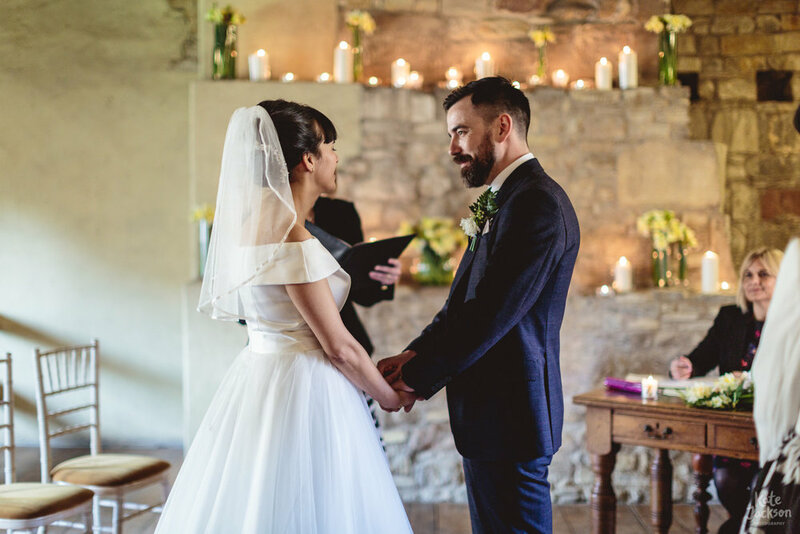 They amazingly planned their Spring wedding in just 6 months and got to say 'I do' on Good Friday last year at Blackfriars Priory in Gloucester, Zara's hometown. 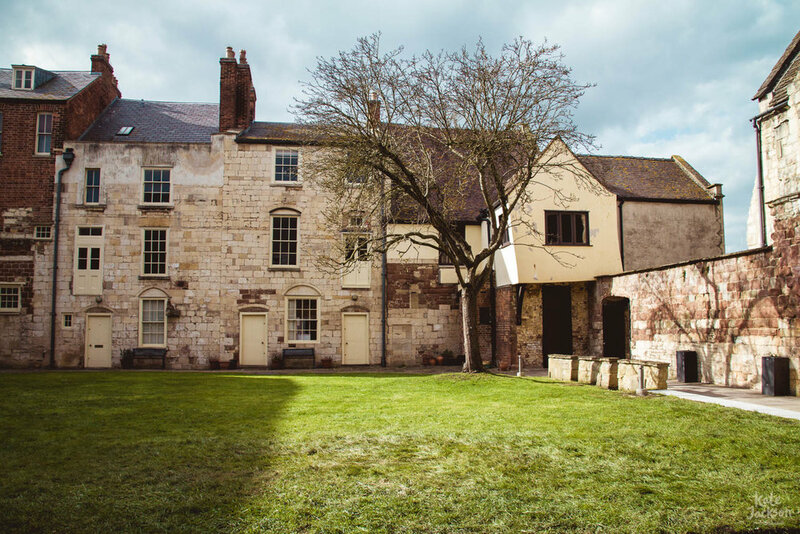 It’s a beautiful 13th century monastery right in the city centre, and such a cool rustic venue perfect for their vintage and fun style. 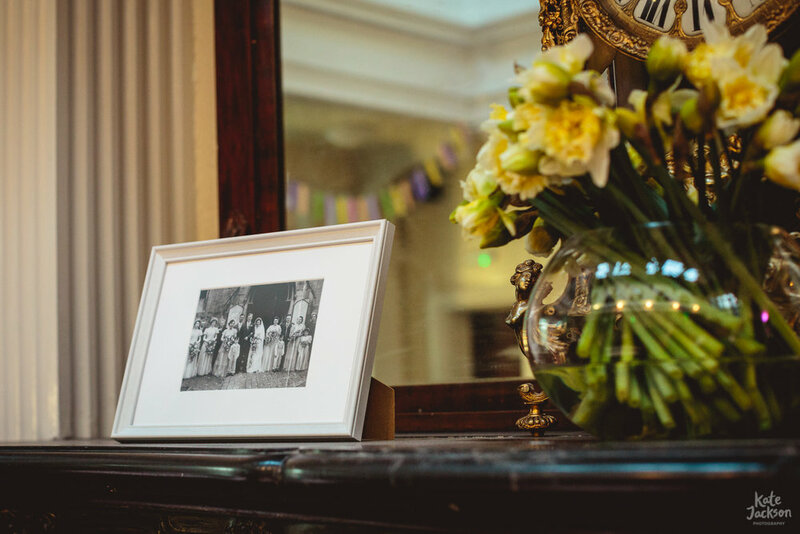 They filled the venue with hundreds of glorious sunny daffodils they got from Birmingham Flower Markets and it gave it a wonderful Springtime feel. 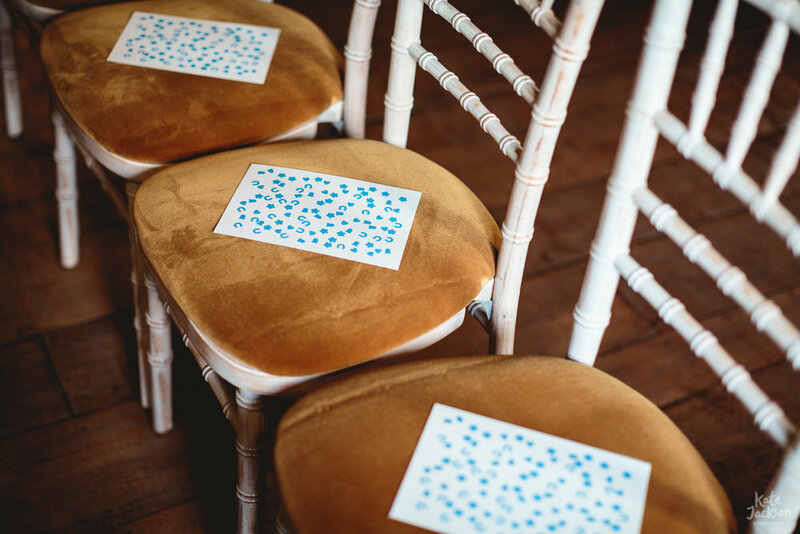 There were so many special touches to their day, from Zara's Grandmothers wedding ring (something old), to the bespoke hand embroidered garter from Daisy Sheldon with their initials and wedding date (something blue, and a gift from her mum), to the photos of their Grandparent's on their wedding day's beautifully framed at the reception. 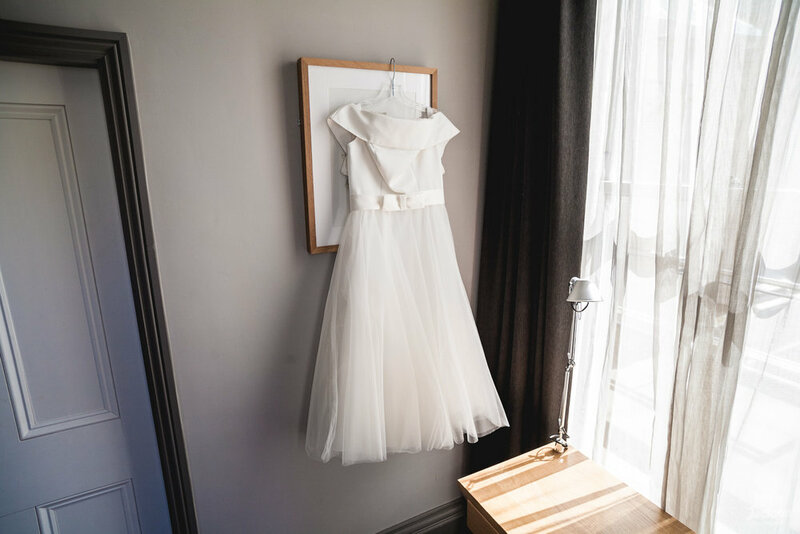 Zara got ready with her mum, Bridesmaid Emma & Bridesman Danny at Montpellier Chapter in Cheltenham, such a gorgeous dreamy setting to get ready. She found her dream dress at a wedding fair at the NEC, somewhere she never thought she'd find her wedding dress. I'm sure you'd agree she looked HOT and the vintage style tea with hooped skirt totally suited her style. Stuart meanwhile got ready at home and then met friends and family at Robert Raikes, a pub just around the corner from Blackfriars Priory where I popped along just before the wedding ceremony (my kinda couple!). He wore a Gieves and Hawkes Prince Charles check navy wool three-piece suit with Tricker’s brogues - and totally rocked it! The spring time bouquet and buttonholes were created by local florist Jordon from Isherwood & Co and they were so lovely. 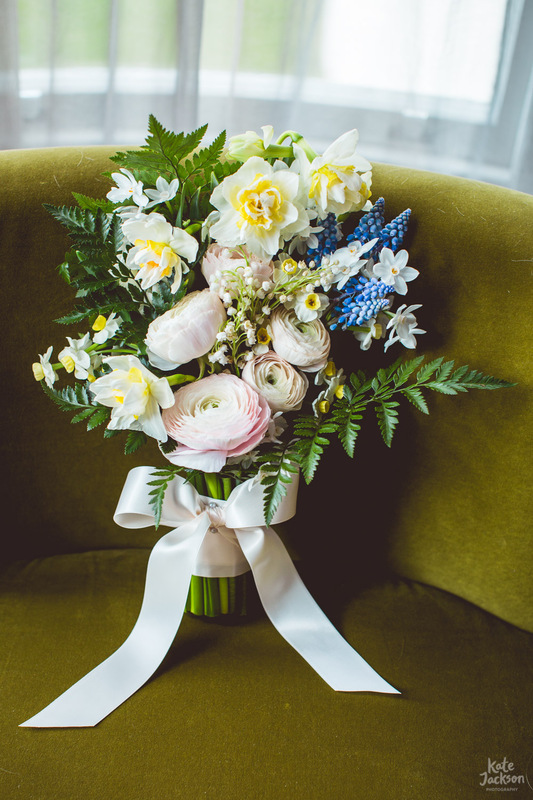 They wanted to go for a natural garden style so Jordon featured daffodils, paperwhites, muscari, creamy-peach ranunculus and lily of the valley and tied with ivory ribbon. The buttonholes were paperwhites with fern, tied off with thin navy ribbon, Stuart’s had added lily of the valley. Zara walked down the aisle with her mum and younger brother and it was a pretty special moment. The ceremony featured special readings from close friends and their best friend Kim sang a reworked version of Sea of Love - it was super sweet and funny ceremony all round! They opted for minimal group shots & couple photos, as they wanted a documentary style and if you ask me they were more interested in getting to their reception and dancing the night away (oh and did we do just that). Stuart had arranged a Vintage Mini to take them to their reception at Uffculme Centre in Moseley, in Birmingham. They kept the decor minimal and made all the decorations themselves and it looked super cool and effortless but along with the daffodils gave the quirky venue even more of a fun feel. It wouldn't be Easter without hot cross buns and wanting to opt for something more untraditional for their wedding cake they had some specially made by a local community bakery in Birmingham with not one but two flavours! Zara chose an orange and chocolate one and Stuart choose traditional fruit and earl grey flavour. Instead of a cross on top they had their initials. Guests took them away in paper bags to eat the next day for breakfast. Sticking with untraditional they chose to have a picnic style buffet and I can attest to the fact it was delicious. It consisted of salt beef, pork pies, local cheeses and salads and they had about 30 chutneys made by a friend from his allotment. The food was organised by Bearwood Pantry a local food co-op and they sourced it from an organic community farm in Staffordshire. All of the produce was from the farm and the butcher made all the meat products. Bread was from Loaf their local baker who also made the hot cross buns for their alternative wedding cake. After a couple of speeches and some giggles it was time to get our dancing shoes on and I have to say it was one super fun party. The dance moves were awesome to say the least, I stayed until the very end to do some dancing myself (camera in hand of course). Zara & Stuart's relaxed approach to their day really showed, it was such a fun wedding and I loved being part of it. They didn't sweat the small stuff, like what colour their napkins were, instead choosing things that reflected their personalities and all being about fun, I can say that they achieved that and then some. Can't believe it was one whole year ago! Thanks for having me guys, you were totally awesome, so awesome in fact that your wedding was featured on Whimsical Wonderland Weddings. Shout out to all the awesome suppliers involved in making Zara & Stu's Blackfriars Priory wedding one super fun SHINDIG! Looking to book a relaxed & natural wedding photographer at Blackfriars Priory? Get in touch to check my availability throughout the UK. 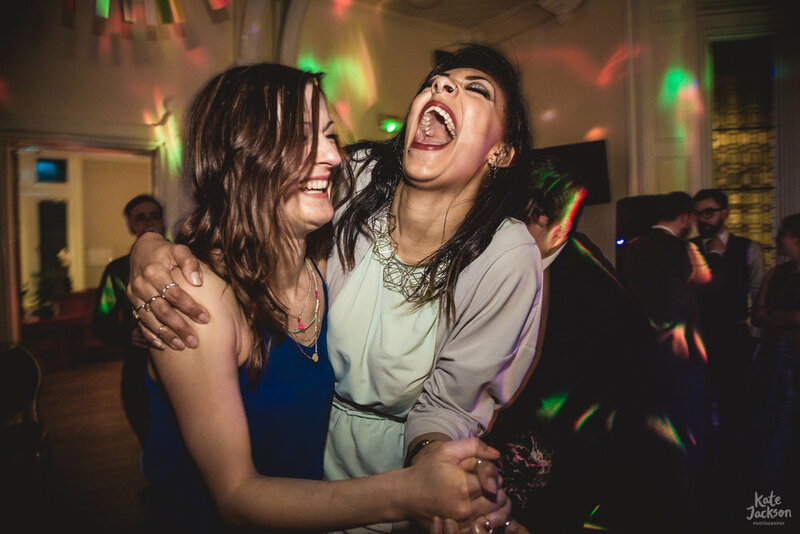 I'm a Birmingham based wedding photographer specialising in fun & relaxed documentary wedding photography. She offers professional photography services in throughout the West Midlands, Warwickshire, Cotswolds and UK Wide as well as travelling further afield for Destination Weddings in Europe & Worldwide.